1. Preheat oven to 350 degrees F. Line 2 standard 12-cup muffin pans. 2. Whisk together flour, baking powder, and salt in a bowl. Beat butter on medium speed with an electric mixer until creamy, 2 to 3 minutes. Gradually beat in sugar, until light and fluffy, 1 to 2 minutes. Reduce mixer speed to low and beat in eggs, 1 at a time, just until blended after each addition. Beat in vanilla. Beat in flour mixture alternately with buttermilk, beginning and ending with flour mixture, just until blended after each addition. 3. Transfer batter to lined cups. Bake, rotating pans once, until a toothpick inserted in center comes out clean, 24 to 26 minutes. Cool in pans on a wire rack, 15 minutes; transfer to the rack to cool completely. 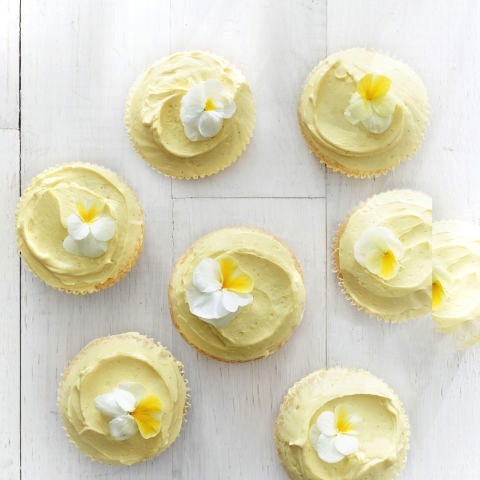 Frost with butter-cream frosting and garnish with edible flowers.